The Golden Grizzlies season came to an end on Saturday, Nov. 10 with a loss to the Indiana University Purdue University-Indianapolis (IUPUI) Jaguars, 3-1. Before that, the team took on the Northern Kentucky University (NKU) Norse on the road, losing 3-1 as well. After defeating Northern Kentucky in the first set, 25-23, Oakland dropped three straight sets to the No. 3 team in the Horizon League. Jamie Walling led the team in kills with 16, Krysteena Davis led the team in blocks with four and Jordan Lentz led the team in assists with 36. After losing the first set by two points to IUPUI, Oakland was able to convincingly win the second set, 25-13. The next two sets were back and forth, but the Jaguars were able to come out on top, winning the sets on their home court, 25-21 and 25-22. Walling once again led the team in kills with 26, and Davis and Mackenzie Schneider led the team with three blocks each. 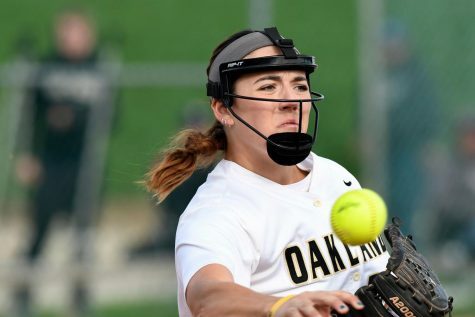 Davis finished her senior season at Oakland with 431 career blocks, two shy of the all time record. With 399 block assists, she fell six short of that school record as well. 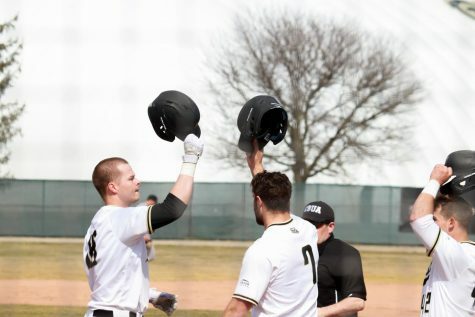 This loss sets Oakland’s final record at 10-17 overall and 6-10 in the Horizon League, missing the Horizon League tournament by one game. 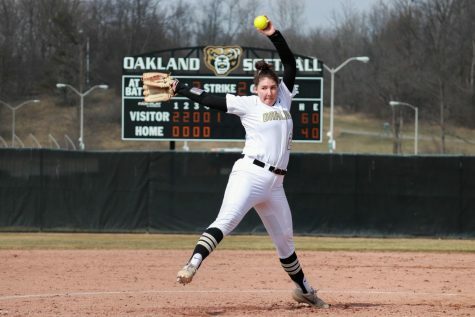 The Golden Grizzlies had two games this past week, losing both. On Thursday, Nov. 8, the women traveled to Mount Pleasant to take on the Central Michigan Chippewas, losing 104-61. Taylor Jones led the team with 20 points and six rebounds, adding two assists as well. Kahlaijah Dean was the second leading scorer, adding 10 points on eight shots. The team struggled to shoot threes, making six of 22, good for 27.3 percent. The women’s basketball team took on the University of Indiana Hoosiers at home on Saturday, Nov. 11, losing 59-32. The game got off to a rough start, as Oakland was only able to score three points in the first quarter. After holding the Hoosiers to three points in the second quarter, the game had become closer, 26-12 at the half. The second half was much more offense-oriented, with both teams being able to hit more shots. After a close third quarter, the Hoosiers pulled away in the fourth, outscoring Oakland 20-9. For the Golden Grizzlies, Dean was the leading scorer, scoring 14 points on 5-15 shooting. Jones was not far behind with 13 points on 5-18 shooting. Oakland played well on defense, recording 11 steals and three blocks, but offensively it was tough sledding. Oakland shot 18 percent from the field, and was 5-24 from three, shooting 20.8 percent.